Colorado is not without its unique and colorful agates, even though collectors here have more often concentrated on its wonderful assemblage of crystallized minerals. 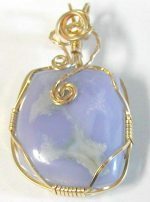 One such agate is noted for it’s wonderful neon purplish-blue color, which is quite rare in agate. The blue has almost a fluorescent tone to it. I have named it Columbine Agate, due to the resemblance in color to the petals of the state flower, the blue columbine. Not all of the agate is blue, in fact only a very small portion. Most is ordinary shades of gray and white. What element causes the blue color is unknown. This agate was born from silica-rich waters, which percolated through porous volcanic basalt in the heart of the Colorado mountains as they formed. Cavities or “air bubbles” and cracks in the basalt allowed space for the silica water to form chalcedony and banded agate in seams and nodules. As this volcanic rock was later weathered by exposure to water and ice, the hard agates are released and accumulate on the surface, with new ones washing out with heavy rains and snow melts. What you see in on the next pages is the result of dozens of trips to the collecting site. Notice that the pieces tend to be small. All of this makes for a very rare agate in its best colors. Because of their smallish sizes and often thin, very irregular shapes, cutting nice large cabochon gems from the material is challenging. However, the results are well worth it. Some of the pieces are also very intriguing in shape, and make wonderful pieces for the skilled wire wrap or jewelry artist. To order, simply drop us an email or use our order form to check on the availability of the piece(s). We accept PayPal, cash, or check. To pay via credit card, use PayPal to process your credit card. For information on our guarantee, shipping costs, and method of shipment see our Terms & Conditions page.